The Meiji Restoration saw an end to the Tokugawa shogunate rule of the Edo period in favor of imperial rule in Japan. The implementation of new political structures drastically changed the methods of military decisions and wartime preparation. The Navy Ministry was created in 1872 as a means of bureaucratic control over the navy during times of military conflict. The ministry was in charge of everything from budget management and ship construction to political relations and navy policy implementation. All affairs of the Navy Ministry were ultimately under the control of the Minister of the Navy. The Navy Minister held much political power. 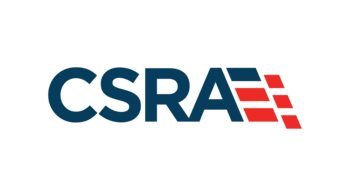 Similar to the United States Secretary of the Navy, Imperial Japan’s Navy Minister controlled recruiting, vessel construction and repair, and all other affairs immediately related to the navy. He was both a member of the Cabinet and a direct report of the Emperor rather than the Prime Minister. The Navy Minister’s close relation with the Emperor is uniquely reflected on his flag of rank. 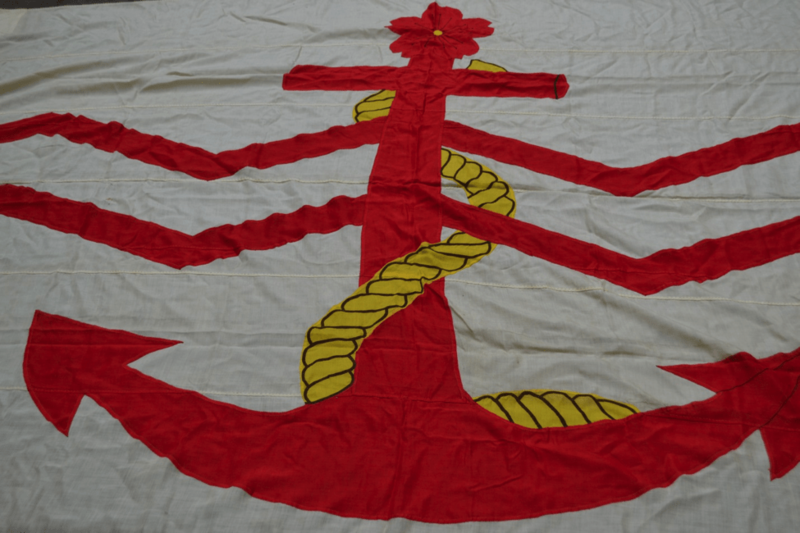 The Imperial Japanese Navy rank flags were initially based off of the national flag, the hinomaru or sun-disk flag. 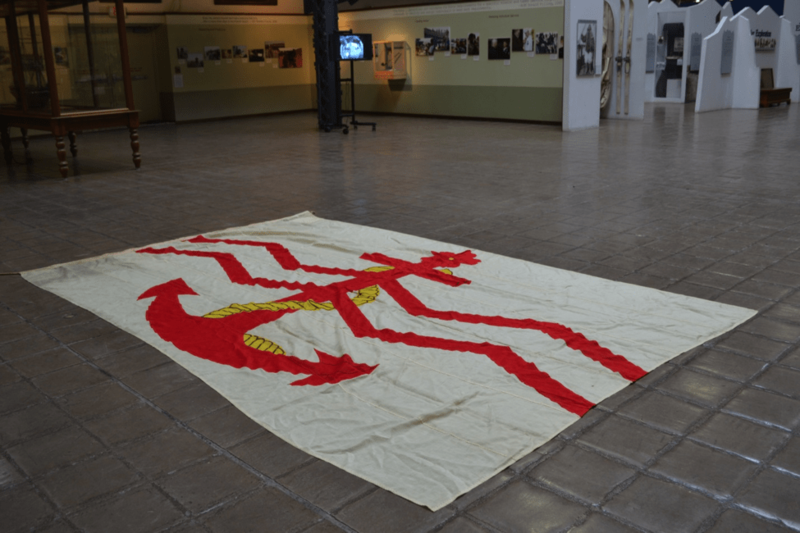 In 1897, new flags and command pennants were created to reflect the Rising Sun Flag with sixteen red rays of the Imperial Japanese Army and Imperial Japanese Navy. The Rising Sun Flag became the typical Japanese naval ensign, visible on almost every flag of rank and commissioning pennant. The Navy Minister’s flag is the only Flag of the Japanese Imperial Navy without the mark of the Rising Sun. The flag of the Navy Minister bears a crimson anchor on a field of white with two red, horizontal zig-zag stripes. Above the anchor is the mon of Japan, a stylized cherry blossom, the national flower of Japan. The placement of the anchor beneath the cherry blossom may be indicative of the Minister of the Navy’s direct contact with the Emperor, a likewise unique attribute of his rank. 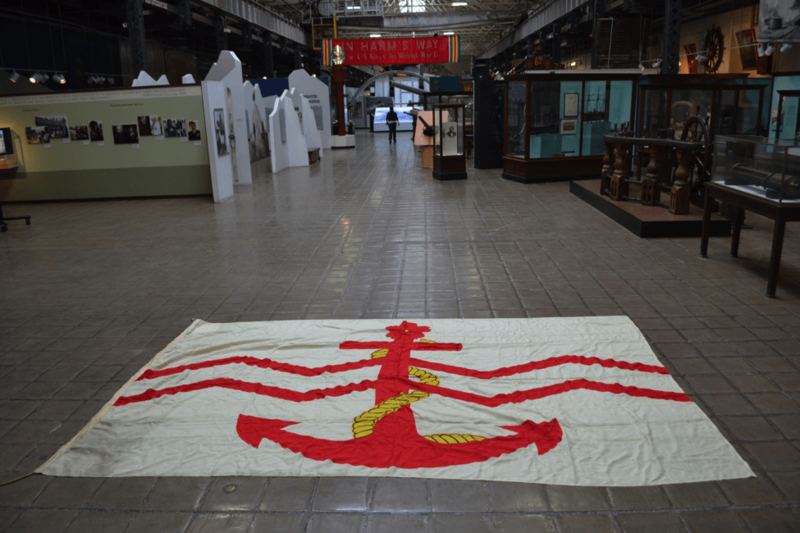 Lady Henry Moore donated the World War II-era flag to the Naval Historical Foundation in 1964 on behalf of her first husband, Admiral Theodore Stark Wilkinson, a veteran of both World Wars. Then Rear Admiral Wilkinson served as Director of Naval Intelligence during the early months of U.S. entry into WWII. By 1942, he reported as Commander Battleship Division TWO, Pacific Fleet and became Deputy Commander, South Pacific Area and South Pacific Force by January 1943. He was redesignated Commander THIRD Amphibious Force, Pacific Fleet with rank of Vice Admiral in 1944 and retained that rank through the completion of World War II. Admiral Wilkinson would go on to serve temporary duty in the Office of the Chief of Naval Operations in 1945, concluding his naval career as a member of the Joint Strategic Survey Committee of the Join Staff, Joint Chiefs of Staff. 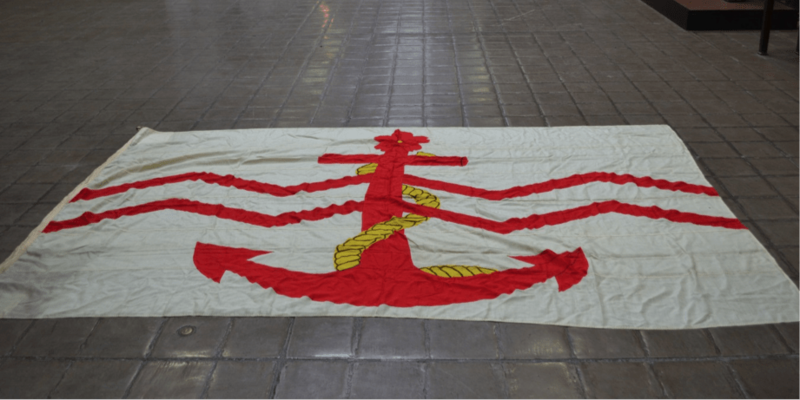 Due to the specifics of Admiral Wilkinson’s service record, the original owner of this flag most likely was one of three Ministers of the Navy of the Japanese Imperial Navy: Admiral Shigetarō Shimada, Admiral Naokuni Nomura, or Admiral Mitsumasa Yonai. This flag is indicative of both the shift in Japanese political structure from a shogunate into an empire as well as Imperial Japan’s quick advancement in naval technologies and bureaucracies. In the Naval Historical Foundation’s collection, it represents the valor and commitment of U.S. service men and women who sail around the globe for the purpose of protecting their family, friends, and country. Asada, Sadao (2006). From Mahan to Pearl Harbor: The Imperial Japanese Navy and the United States. US Naval Institute Press. Jansen, Marius B. (2000). The Making of Modern Japan. Cambridge: Harvard University. “Japanese Symbols”. Japan Visitor/Japan Tourist Info. Retrieved October 9, 2014. Nussbaum, Louis-Frédéric and Käthe Roth. (2005). Japan encyclopedia. Cambridge: Harvard University Press. Schencking, J. Charles (2005). Making Waves: Politics, Propaganda, And The Emergence Of The Imperial Japanese Navy, 1868–1922. Stanford University Press. Ditty Bag: Collections of the Naval Historical Foundation is a new artifact blog written by Emily Pearce, NHF Middendorf Curator. She will periodically write posts about various artifacts and accessioned items in the Naval Historical Foundation collection and their impact on naval history. You can view all of the collections highlighted in Ditty Bag on our Flickr page HERE. 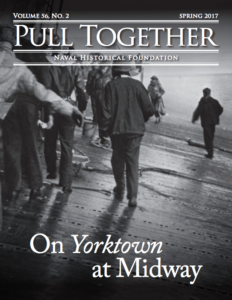 To contact Emily or to inquire about NHF collections, please email Emily Pearce at epearce@navyhistory.org. 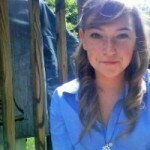 For previous releases of Ditty Bag, Please go HERE.